Malena Marvin for reviewing the text prior to publication. The 263-mile Klamath River, the second largest in California, is one of the West Coast’s most important rivers for endangered populations of Chinook and coho salmon and steelhead trout. It flows from the high desert of southern Oregon, through the Cascade Range, down to the coastal redwoods of Northern California, and out to the Pacific Ocean at the town of Klamath. The tribes along the river have inhabited the region for thousands of years, sustained by, and living in concert with, their natural surroundings. The river and its plentiful salmon population was, and still is, a focal point of their spiritual practice. During the Spring Chinook run, the tribes all along the river — starting with the Yurok at the river’s mouth, then the Hupa, Karuk and Shasta, and finally the Klamath tribes of the headwaters — could share in the abundance of this sacred fish. Ceremonies centered on the annual salmon runs helped to regulate the use of this precious resource to the benefit of all the river’s tribes. Dam building on the Klamath began in 1908, and by 1962, there were six dams on the river. These dams, however, were constructed without any mechanism to permit salmon to migrate upstream to their spawning grounds, effectively ending salmon migration at the Iron Gate dam, which sits 190 miles upstream from the river’s mouth. Tribes above the dams were thus deprived of the ability to fish salmon altogether, while those further down the river switched to Fall Chinook, which were less prized but became more abundant because they were able to spawn below the dam. Irrigation for farming upriver also drained off much of the Klamath’s water, sometimes leading to violent conflict between farmers and tribes. Salmon spawning today represents just a small fraction of its historic levels, which once made the Klamath the third largest salmon producer on the West Coast, and those numbers are decreasing as fish mortality rates rise. Dams reduce the flow of water in the river, which raises the water temperature, depletes oxygen levels, and promotes the growth of parasites and toxic algae, especially in the still waters of the reservoirs behind the dams. According to biologists from the state of California and the U.S. Fish and Wildlife Service, poor water quality caused by low river levels — which in turn was due in part to the overallotment of water to farmers — was to blame for a massive die-off in 2002, which killed as many as 70,000 fish. Fish kills and the subsequent closure of commercial fishing seasons have hurt the economic well-being of this rural region as a whole, forcing the shutdown of fisheries that were once able to sustainably harvest salmon. Massive blooms of the algae Microcystis aeruginosa, which secrete the potent liver toxin microcystin, have filled the reservoirs behind the Copco and Iron Gate dams with levels of microcystin reported as high as 4,000 times the water-quality standards set by the World Health Organization. The toxin can harm humans as well as animals, leading state regulatory agencies in recent years to post signs during the warmest months warning people not to touch the water for the 200-mile stretch between the Copco reservoir and the ocean. This health danger poses a particular threat to tribes along the river. In 2005, Klamath tribes and farmers began holding talks in an effort to end their decades-long conflict. At about the same time, PacifiCorp — controlled by Berkshire Hathaway, the holding company of billionaire Warren Buffett — applied for a 50-year federal relicensing of its lower four Klamath River dams, all in California. In an attempt to avoid potential lawsuits, PacifiCorp began negotiating terms and conditions with the various stakeholders — tribes, farmers, commercial fishermen, environmental groups and federal agencies. These diverse factions, realizing they had a common goal — preserving the river — and perhaps a common enemy in PacifiCorp, began working together to craft a plan that would meet the needs of all parties. On Jan. 15, 2007, after an arduous negotiation process, the groups announced a $1 billion plan that, in concert with removing the four California dams, would restore salmon to the river and equitably allocate water resources and power supplies once the dams were removed. Dam removal is actually a profitable proposition for PacifiCorp. In 2007, the California Energy Commission concluded that removing the dams and buying replacement power elsewhere would be far more cost-effective than relicensing the dams and retrofitting them with fish ladders and water-quality improvement devices, which the federal government is demanding as a contingency to PacifiCorp’s relicensing request. The commission said that, according to PacifiCorp’s own data, keeping the dams would cost about $114 million more than dismantling them, and an analysis by the Federal Energy Regulatory Commission has confirmed those findings. On Sept. 30, 2009, all the stakeholders — including PacifiCorp — officially consented to a draft agreement of the dam-removal plan. The groups involved in the negotiations are expected to sign a final document in December 2009. The federal government would then undertake about three years of studies, environmental review and cost analysis before Interior Secretary Ken Salazar makes a final decision on the plan; according to the terms of the agreement, Salazar must decide by 2012 whether removing the dams is in the public interest and will benefit the fish. If Salazar approves the dam removal, decommissioning would begin in 2020. The plan, which has a cost cap of $450 million, would be the largest dam-removal project in the world and one of the largest U.S. river restoration efforts. Regarding the dam-removal agreement, Klamath Riverkeeper says, “While this is a positive step, the dams aren’t out yet, and much work remains to ensure dam removal actually happens.” Visit their Web page, “Un-Dam the Klamath!” to learn more. The group Berkshire Shareholders is encouraging people to write letters to PacifiCorp’s parent company, encouraging them to close the deal. Learn more here. Barnard, Jeff. “U.S., Berkshire’s PacifiCorp discuss dams issue.” Associated Press, June 11, 2008. California Energy Commission. “Energy Commission analysis says Klamath dam removal, not upgrades, more beneficial than earlier projected.” News release, March 27, 2007. Carpenter, Kayla and Erika Chase. 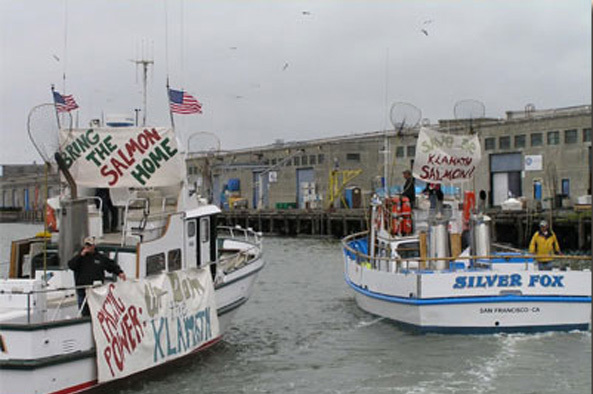 “Youth perspective: fish be not dammed.” San Francisco Chronicle, September 25, 2005. Driscoll, John. “Klamath dam owner looking toward settlement.” Times-Standard (Eureka, California), July 16, 2008. Gorn, David. “Klamath River dams’ removal hinges on owner.” National Public Radio, March 5, 2008. Jenkins, Matt. “Peace on the Klamath.” High Country News, June 23, 2008. Karuk Tribe, Klamath Riverkeeper, Pacific Coast Federation of Fishermens’ Associations. “CA court sides with tribes, fishermen, conservationists on clean water case; judge orders CA water board to reconsider regulation of toxic waste in Klamath River.” News release, June 16, 2008. Klamath Restoration Initiative. “Draft Klamath Hydroelectric Settlement Agreement and Summary.” September 2009. Klamath Tribes. “Former foes unite to solve Klamath crisis.” News release, January 15, 2008. Office of the Secretary, U.S. Department of the Interior. “Secretary Salazar Announces Draft Agreement on Klamath Dam Removal.” News release, Sept. 30, 2009. Peña, Laura. “Restoring Salmon Nation.” Earth Island Journal 22, no. 2 (2007).